I can’t believe Claremont doesn’t like the Jamie McKelvie designed Jean Grey costume. She looks amazing. I hope you gave Weezie a hug on behalf of every one of us. It looks good when it’s drawn well. The weird hip/waist level line that goes high around the side makes her look oddly misproportioned some of the time. Without the jacket it looks a little weird. I I can see what he means, even though yeah, I’m with you, I like it. I loved him ragging on the X-Men Gold book, though. Kitty’s look especially. I wonder what he makes of “Prestige”… Can we have a “Getting Catty with Claremont” podcast please? Next Patreon goal? Maybe he was referring to the ANAD Jeen costume she wore in the EXM run? While I have my own opinions about which X-Men costumes are awful, I was not expecting Chris Claremont to say he found teenage Jean to be ugly, not just the costume. I figured this would be a perfect question forna couple of Florida kids like youurselves, but what would be your idea for a X-Men Theme Park? Thinking that Halloween Inferno Nights would be awesome! There needs to be a roller coaster called the Fastball Special. You can get hotdogs on a stick, but they only come in threes, with a special holder that fits over the back of your hand! As someone whose Disney Parks fandom rivals his X-Men fandom, I think a lot about at least an X-Men ride, if not an X-Men park. The obvious choice is essentially a riff on Forbidden Journey (what this also means is that – like FJ or Star Tours, it takes place more or less in a non-point of continuity). You’re touring Xavier’s in an attempt to build good will between humans and mutants (so the X-Mansion is the queue). He’s about to do a demonstration of the Danger Room on a safe setting (in a “touring vehicle” with “safety googles”), when it’s hijacked. The ride is essentially the X-Men trying to keep you alive as the Danger Room switches settings (which would allow for you to go everywhere from the Savage Land to the Brood Homeworld to Asteroid M to the Shi’Ar Empire and deal with any villain) – similarly, like Star Tours, it would allow for variations between rides/new additions. 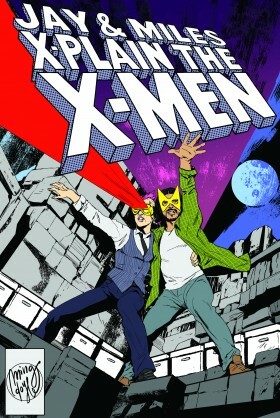 Other option would be that you’ve been duped to sign up to be on Mojo’s new show and the X-Men are there to save you. Again, this would allow for pretty much anything to be an option. Also, Spiral could give the safety instructions with Longshot demonstrating what not to do (with someone next to him getting hurt as he lucks out every time). I found Claremont rude. I understand he’s catty(angry), but that was akward and unnecessary. He may not like what’s happening in comics today or what happened to him 20+ years ago but do we need to hear him vent. Compare Miles and Elisabeth’s interview with Walter Simonson where he was charming, polite, frank and insightful. Louise sounded lovely. It’s a shame CC barely let her speak. Maybe she can come back sometime, sounds like she has some amazing tales. Maybe we can get him back when the podcast covers his 00’s run and discuss the Neo. Honestly, I felt the same way? I totally respect him, he’s a legend but some of his comments, not very professional and neutral like a lot of the other comic industry speakers we’ve heard on the show. He has a lot to say, and I respect that but I rolled my eyes a few times when he kept going on and on about the current industry or on things other writers/editors did that he doesn’t seem to approve of. He’s a passionate individual yes, but man. If you listen to his last time on the podcast, he was definitely a little less confrontational with modern Marvel. I’d recommend checking this out. Also in episode 100, which was a fairly well-prepared affair, Chris did point out he had not always been the most graceful at conventions. But, Louise was also a little provocative in a playful way. “They want names, Chris.” I have a feeling X-Factor’s creation has become something of an act for the two of them, and they got into it. Which is a shame, as the podcast was just covering the end of X-Factor for both of them. I would have loved to hear about that. That said, the audience might have been more general at the convention; previous live shows included questions from people who were new to X-Men and wondering where to begin. Perhaps Jay’s opening question was an attempt to direct the discussion to something which would satisfy both old and new fans? I have to agree with that; he seemed to hate *everything* — from modern status quos, to intro pages to writers retreats to the McKelvie Jean costume and on and on and on. And… OK, some of that is questionable, but in the context, the man just sounded really bitter and old. … I felt kinda bad for him. Wish we could have heard more from Louise Simonson, but still an amazing episode and loved hearing the bards speak. I also feel we are now closer to getting that follow up story about the X-clones lost in space… Great episode and thank you for all the trouble/work that made it available to everyone! That almost sounds like the ideal project for Marvel to give him at this point. They’re basically the characters he knows and loves without much in the way of continuity restraints. Whether or not anyone does something with those Brood-created X-Men, at least we now know that the cover came first, the story second. Best medium for Inferno? How about Guerrilla Performance Art? Just have possessed staplers and lawnmowers inside New York City. I thought this was the most exciting Claremont interview in ages, precisely because he let loose. Honestly, I’ve found most of his twenty first century interviews to be overly diplomatic. His “how do you compare?” response when taking about collaborators is another example of his stock polite answers. I suspect it’d be more telling to ask him about specific creators and what he felt they did best. I was happy with the change in tone after that. That said, I’d definitely like to hear more from Louise Simonson. She was egging on Claremont’s inner performer but I’m sure she’d have some great stories in a solo interview. This is actually the most sympathetic I’ve felt towards Claremont since about 1986. It was really refreshing to learn that he was as pissed off about the creation of X-Factor as I was — if anything, even more! Yeah he went grumpy old man on many current things, but I’m inclined to think he’s right on at least half of what he said there, too. If you want to hear a great Simonson interview, the Uncanny X-Cast did a corker with her about five years ago. It’s absolutely worth a listen. A quick google provided me with this, which I’m guessing is the one. I enjoyed the episode immensely even if Chris’ comments came off a bit extra at times. On the other hand, his response at the end of the show regarding Jean and Logan made me legit cry. I for one enjoyed catty Claremont. Especially when he got to the Teen O5. I 100% agree with him, Jean’s costume and hair are awful, but there is more to it than that. From a writing perspective, I’ve hated that conceit since Bendis introduced it. Bad costumes aside, I felt it should have only lasted for the 1st storyarc, and it’s gone on far too long now; no one has quite gotten the characters’ voices correct; and they are depicted as far too young — from the point in time they were plucked, Hank was over 18 and Jean was about to start college, yet the Teen O5 is always depicted like they are only like 15. But then again, my bias is showing because I so much want Jean to stay dead because her death was perfect, and the Teen O5 thing seemed like a cheap way to have a Jean without having JEAN … and now they are bringing the real Jean back anyway. I feel very “meh” about that. Here’s what else I loved about the interview. I could feel Chris and Louise’s passion for these characters they have not written in years. Chris seemed especially passionate about the Excalibur characters, and his Nightcrawler mini, and I totally get that. And Louise seemed to brighten at the mention of Power Pack and getting to talk about June Brigman’s art (and I swear I could hear her smile at the mention of Bret Blevins’ art too). It’s always great to hear from creators talk about work they love. Oh, and a Warlock movie, what Chris was describing, with the right technique and director … did anyone else think a) a practical Henson-creature-esque Warlock with a tiny bit of CG mixed in and b) a director like Neill Blomkamp, who got so much emotion from aliens and robots in his previous films? I was pretty much on your side re the O5 but Bunn’s X-Men Blue has got me turned around on it. I’m pretty pleased with it, and it’s great to have a pure teen X-book again. There’s Gen X for the school/angsty stuff, and Blue for the soapy/superhero stuff. They’ve got Polaris and Danger as teachers, and Magneto as their headmaster, and they’ve added a young Wolverine and now Vampire Storm. Even with Secret Empire tie-ins and being bi-weekly, it’s managed to stay largely pretty good. The age thing I’m not too worried about, since it’s been fun. Jean’s hair is bloody awful, but other than that I’ve been pretty happy with it. But then again, I’ll happily have Ratner back before giving Blomkamp the reigns to an X-Men film, so I’m guessing we’re pretty different people. Ha to each his own on the directors. That’s what I love about the X-Men fan community, we all have so many different ideas about the same characters but we at least try to keep it civil! In the spirit of that, maybe I’ll re-investigate the X-Men Blue series. I did not like A-N X-Men, and I usually like Bendis’ writing, but I thought the O5 were greatly mishandled. Maybe I’ll like Bunn’s writing. But I just haven’t thus far enjoyed the concept of the displaced O5 over the two volumes of A-NXM. I do enjoy what’s happening in X-Men Gold for the record, it seems like a great spiritual sequel to the post-Schism Wolverine & the X-Men->Amazing X-Men->Extraordinary X-Men line-up of characters. I just wish they’d keep the title consistent since they’ve kept most of the characters on that squad consistent. I think that the O5 worked surprising well under Bendis for a while, until what he was doing with them just sort of petered out without an ending. But I think a problem with them is that the basic idea might have actually have worked better if one had brought the younger versions of the classic ‘70s X-Men to the future. It comes down to a misstep that Chuck Austen made in his run (very minor in the list of Austen missteps…) He has Bobby lecture someone that he, Scott, Warren, Hank, and Jean are the “real” X-Men. But the thing is, that feels false to the reader, even if, in principle, it might feel true to the character. The Silver Age X-Men are a historical curiosity for most X-Men readers, I think: the real original X-Men are, functionally, the All-New, All-Different ones. I’m personally a bit of an exception to this, thanks to Marvel UK – but I think it’s generally the case. This sort of juxtaposition between past and present tends to have the most power when the reader is invested in the particular piece of the past in question. I remember that issue you are talking about but I don’t remember what issue number. Pretty sure it was the very low 400s, it was right before Havok and Polaris rejoined the book. I really don’t think Austen got Iceman’s voice right, he always came off as arrogant (another turn-off of the Austen run) but I enjoyed his Juggernaut redemption. BROOD SAGA CLONES! BROOD SAGA CLONES! BROOD SAGA CLONES! I suspect that a practical effects Warlock would be pretty much impossible, since he’s a perpetual shapeshifter and would need more than a touch of CGI to be remotely Warlock-ian. For the record, I think the little joining robot things in the Big Hero 6 movie would be a great way to do Warlock. Does anyone know if anyone has ever asked Peter B. Gillis about how *he* felt about X-Factor? Arguably, it did more damage to his work than it did to Claremont, seeing as it forced an abrupt end to the New Defenders, on which he had been producing some great stuff – even if the use made of Beast, Angel, and Iceman is not particularly prominent among the book’s virtues. That’s a really good question about Gillis. I’m curious, was Defenders already slated to be cancelled before X-Factor launched and that’s WHY it was launched, or did they come up with the X-Factor idea and that CAUSED Defenders to be cancelled? A lot of the end of Gillis’ Defenders run was undone in less than 10 years, including the deaths of the other characters…although I believe it was Gillis himself who undid Moondragon’s death in an Avengers story… Avengers Spotlight maybe, or MCP. …the New Defenders was actually cancelled to make room in the production schedule for the New Universe. The role of X-Factor in it is that those plans led to an editorial mandate that Gillis had to kill off all of the other New Defenders except Warren, Hank, and Bobby, to free the three former X-Men up for being reunited with Jean and Scott. So it didn’t cause the cancellation of The New Defenders, as it turns out, but it did cause the final story to take the grim form that it did. And there were rapid resurrections. I never read the Solo Avengers resurrections, but I followed Gillis to his Doctor Strange work, and he resurrected a bunch of them there. Enjoyed listening to your interview with Chris Claremont and Louise Simonson at NYCC. Was pleasantly surprised to hear my cover for New Mutants #63 mentioned. There’s a bit of a backstory to that cover and that issue’s story that may be of interest to you. Before I joined Marvel’s editorial staff, I was a storyboard artist and illustrator. One of the pieces I did for my illustration portfolio was the illo that became the NM #63 cover. At that point the woman was not meant to be Kitty and there was a different small alien creature sitting on the woman’s shoulder. One day, Chris Claremont was visiting in my office and saw a small print of that illustration that I had tacked to my office wall. He thought the woman looked like Kitty and said, if I turned the small creature into Lockheed, he’d write a story around it. I did so and he wrote a plot based on the cover. If I remember correctly, Weezie did the script. On a side note, I had the pleasure of editing Power Pack and working with Weezie for years. Working on Power Pack was probably the most fun I had while being a line editor. Thanks for posting and including the backstory, this is awesome! Love the cover, love the backstory! I was really looking forward to this episode and was extremely disappointed with Claremont’s attitude. He was bordering on “Get off my lawn!” level crotchety old man territory. He often claims he no longer reads the x-books yet he seems to know a lot of the plot points and goings on and hates them all. I’d much rather hear him talk about what other creators are doing that he DOES like than just a general shitting on everything. You haven’t been steering the line for 26 years, accept that other people have made choices that you wouldn’t or just only talk about your own work. I also really didn’t need to spend 5 minutes listening to him explain how modern blockbusters are made, that was a total waste. Simonson on the other hand was DELIGHTFUL and I wish she’d had more opportunity to speak and I really hope you guys are able to get her back on by herself at some point. I also appreciated her pressing Chris for more details on the drama around the X-Factor launch. That’s one place I think him being cranky would be totally justified because it’s about a situation he was actively involved in and everyone loves when people dish a little behind-the-scenes drama. Kudos to both of you for at least trying to keep Chris on track. I think I’ll go back and listen to episode 100, where I found Chris to be much more insightful. Thanks to whoever posted that X-Cast link with the Simonson interview, I’ll be listening to that soon as well. I’m assuming Chris was critiquing the EXM Jean costume, which was awful. But I’m dying to know what he thought of lumberjack bearded Colossus? That wad Piotr at his dreamy-bohunkiest daddy best ever! Medieval fantasy vagrant Kurt was a treat. It was nice to see him in that kind of outfit outside of the Danger Room. Now he’s in the classic threads, which is fine, but they almost seem redundant to me because that costume basically exists as a substratum beneath whatever he’s wearing anyway. I think Claremont gets a pass, we’ve all complained about things we don’t like about the X-Men, imagine how proprietary you would feel if you nurtured the characters for most of your career. Very interesting! Could we get a transcript of the podcast, please?